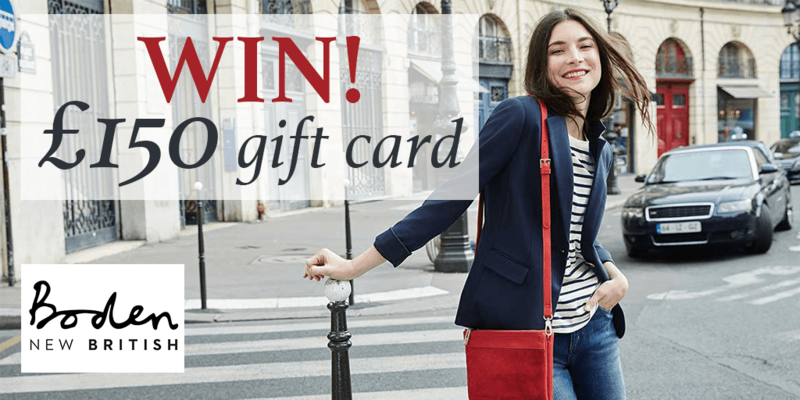 [CLOSED] Win a £150 Boden Gift Card! We’ve teamed up with Boden to offer one lucky winner the opportunity to win a £150 gift card to spend on new clothes at Boden! With plenty of new-season styles and must-have arrivals there’s plenty to treat yourself to this autumn. For a chance to win, all you need to do is enter below! If you can’t wait to get your latest fashion-fix, take advantage of the Boden mid-season sale now on and raise free donations for charity every time you shop online via Give as you Live! The competition runs from 00:00am 29/09/2016 to 23:59pm 02/10/2016. The winner will be announced on the 03/10/2016 – Terms and Conditions apply!